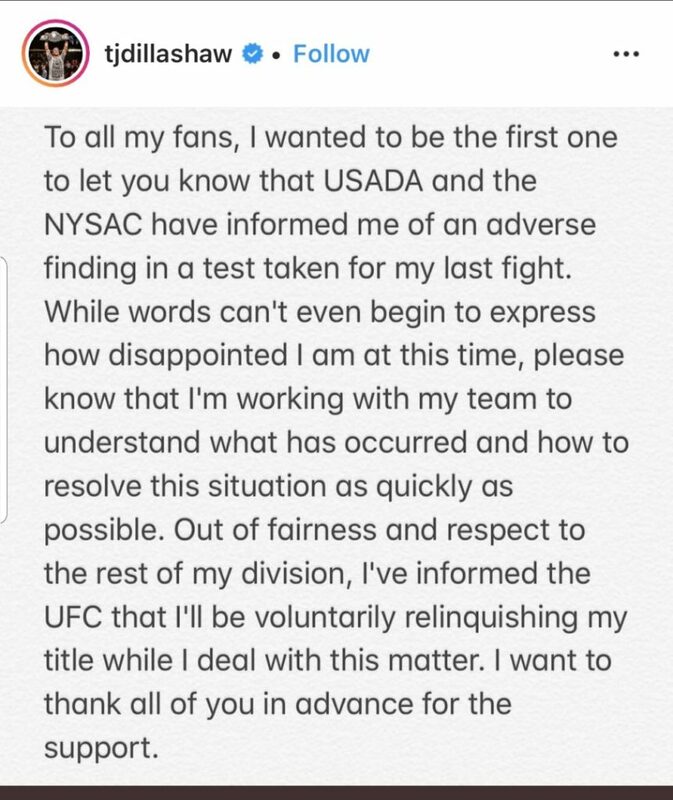 T.J. Dillashaw has relinquished his bantamweight title due to a one year suspension handed out by the NYSAC due to a positive drug test in January. T.J. Dillashaw had been the bantamweight champion for just over a year when he went down a weight class to compete for Henry Cejudo’s flyweight title in January. A fight in which he ultimately lost by knockout in just 32 seconds. Unfortunately for Dillashaw he lost much more than just the fight. As Dillashaw revealed in an Instagram post on Wednesday morning, a drug test that was taken for his last fight has come back positive. Prompting the New York State Athletic Commission (N.Y.S.A.C) to hand down a one year suspension. The suspension is retroactive to the fight with Cejudo, which took place on January 19th of this year. That’s if Dillashaw only has to worry about the N.Y.S.A.C. in terms of punishment. ESPN’s Ariel Helwani believes that United States Anti-Doping Agency (USADA) may hand down a punishment of their own. Starting 2019 Dillashaw had big time aspirations. Wanting to win Henry Cejudo’s flyweight title and potentially even move up and feathweight later in the year. All that talk now gets forgotten. Now Dillashaw and his fans hope to be able to get back into the cage early in 2020. Stick with MMANews as statements from USADA and the UFC are released throughout the day.